← Win, Lose, or Darcy – Excerpt and giveaway! A couple of months ago Sophia Rose invited me to chat with her on Sophia’s Sofa Chats she is hosting in Goodreads, and while we were talking about my hobbies, namely my addiction for travelling, she asked me what I had planned for From Pemberley to Milton in the upcoming months. I hadn’t really thought about it before, but at that moment an idea started forming in my mind. My two main hobbies are travelling and reading JAFF, so why not bring these two passions together and create a feature in my blog dedicated to my travellings that somehow involve JAFF? 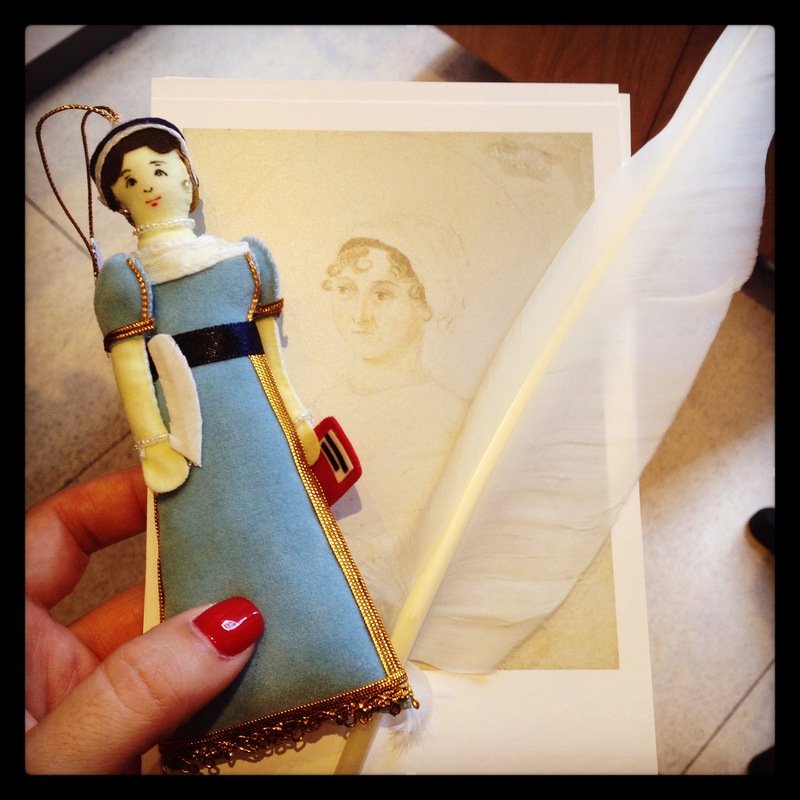 I don’t’ live in the UK and am assuredly not the most knowledgeable person when it comes to Austen related places, but I have travelled a bit, and maybe some of my readers would like to see some of the things I’ve seen, and share my joy at being in those places or meeting certain people. So I decided to create a feature where I could share with my readers the Jane Austen influences in my travels. I called it My Jane Austen Road Trip, and this is my first post. Now, where should I start? Should I start chronologically? Should I choose the trip with more connections to Jane Austen? The most unusual? 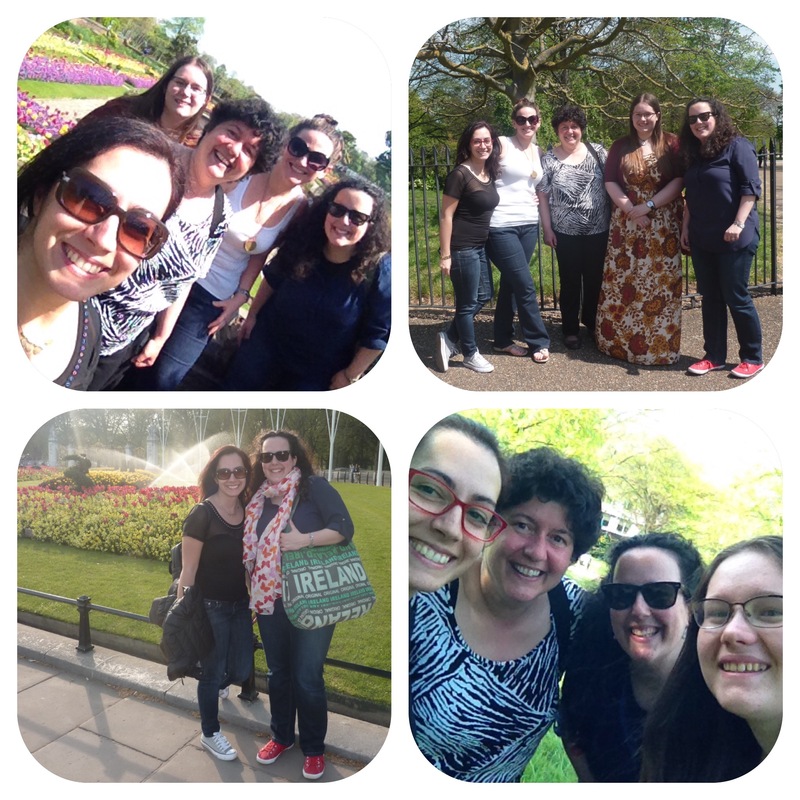 Well, I decided to keep it random, so I’m starting with my last trip to the UK in May 2016 where I had a chance to meet wonderful people connected to the JAFF world! I had planned to visit some friends who live in London, and since I was going to Her Majesty’s country, why not try to meet one of my favorite authors? 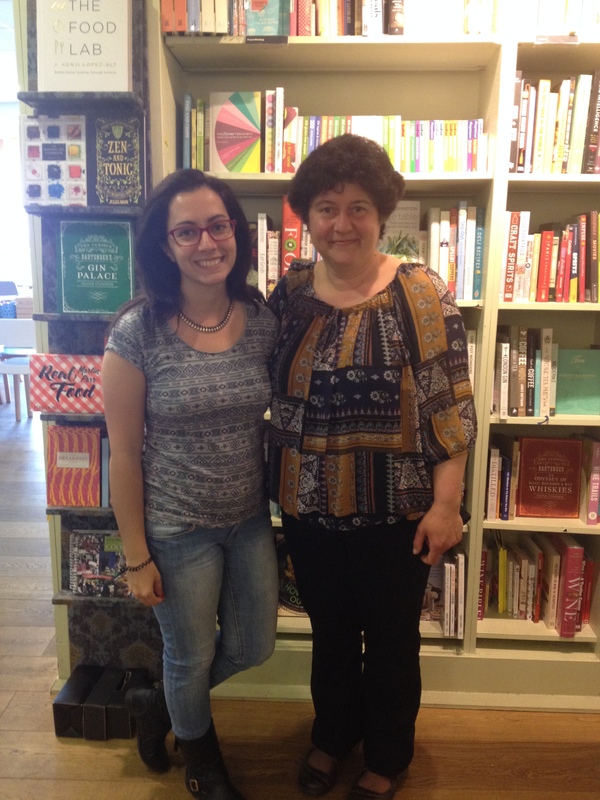 I had known Joana Starnes through the internet for a long time, but had never met her, so when I decided to go to London I timidly asked her if she would be willing to meet and maybe go for a coffee (fyi – asking someone if they want to go for a coffee is a very Portuguese thing. It’s basically our way to socialize with people…but moving on). She was incredibly welcoming and told me straight away she would love to meet me as well. However, she had already booked a brunch with some other people on the day I had available. Bummer right? Well… not so much as she invited me to join them 🙂 How thoughtful is that? So this the long version of how a timid request to meet someone I admired, turned out to be a roller-coaster of events that led me to meet wonderful people along the way. 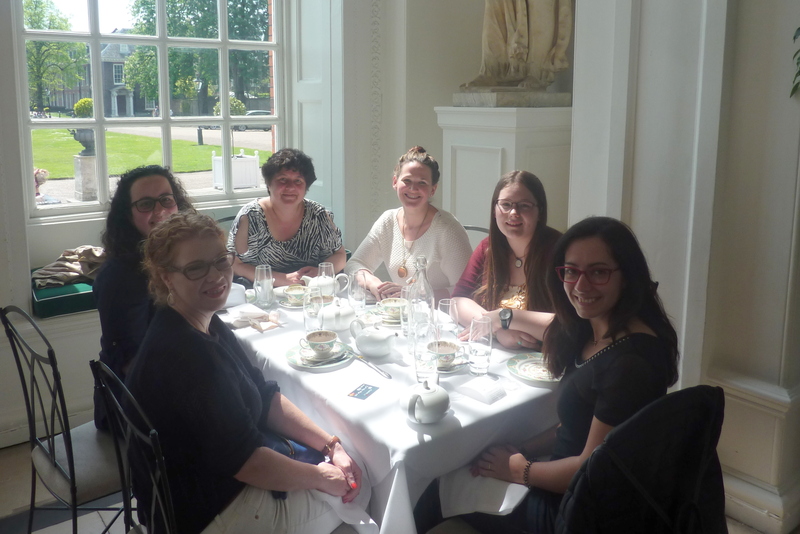 But so it was that on a beautiful Sunday morning I sat at the Orangery of Kensington Palace with Joana Starnes, Elizabeth Adams, Sophie Andrews from Laughing with Lizzie and Ana from My Vices and Weaknesses (who by the way speaks fluent Portuguese! ), and a friend of Elizabeths who patiently stood there for a couple of hours while we talked about all things Jane Austen. We had never seen each other in our lives and this could have been an awkward moment, but I learnt that when JAFF enthusiasts meet, there is never a moment of silence and what we lacked was the time to talk about everything we wanted to talk about! Her departure was felt by all of us, but our journey into the depths of Austen was just beginning, so the rest of us stayed behind for a pleasant stroll on Hyde Park, enjoying the conversation, the company and the sun. Yes, it was sunny in London, and yes it was warm…It’s seems too perfect, no? That’s why in the middle of the afternoon we had to say our goodbyes. Again, nothing good lasts forever (except maybe Mr. Darcy’s love, but he’s not really a real person is he?). My trip could have ended in that day and I would have been happy, after all it’s not every day you meet 2 of your favorite authors plus wonderful people who share your love for Jane Austen, but luckily for me, and unluckily to those who are bored with this post already, it didn’t end there. 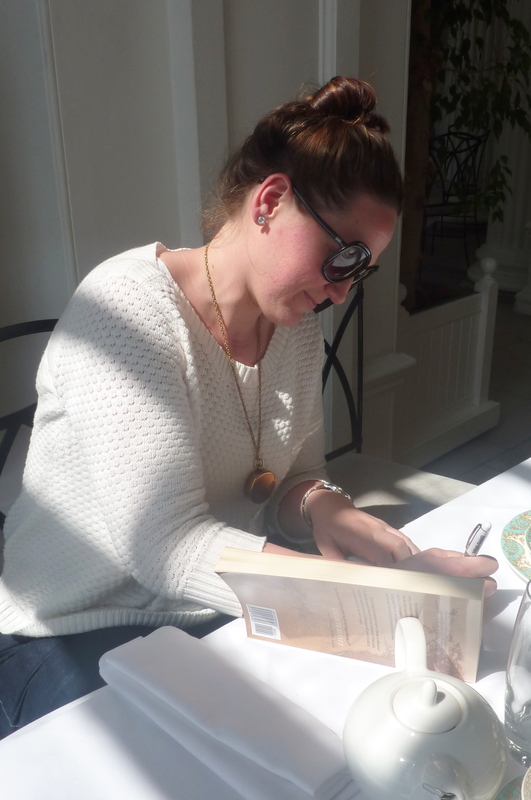 I’m sure you all noticed I had a giveaway for Joana Starnes The Falmouth Connection going on, so I had to meet her the following day to have the book signed for the lucky winner. And guess what? We met, and just talked, talked, talked, stopped for her to sign my books ( I now have all her books signed…yey! My collection of signed books grew exponentially in this trip 🙂 ) and continued talking until she had to go back to her life, and I had to return to my neglected husband, who by now was already thinking I had gone to London just to meet with Austen related people (not that it was too far away from the truth ;). 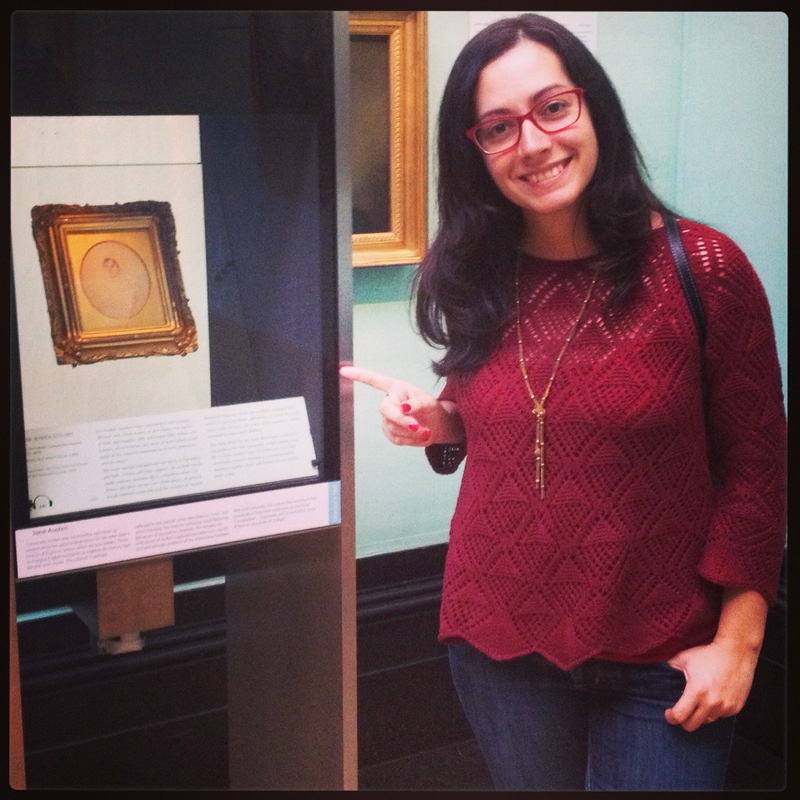 My trip was coming to an end, but before leaving I had to go to a place I had never visited before and that Ana suggested during our walk in Hyde Park: The National Portrait Gallery. There I had a chance to see the drawing Cassandra Austen did of our dear Jane (and yes, I dragged by husband with me again). I confess I was not prepared to what I found there. I never expected the drawing to be so small and faded away. I’m not sure if I ever really thought about its size but the truth is I was not expecting that. Still it was Jane, and it was Jane as Cassandra saw her. I was mesmerized, enchanted in fact. I stayed there for a long, long time and I believe I didn’t say much more then “wow, look at this, it’s Jane Austen”, until Rui (aka, husband) decided it was too much and kindly asked me if I needed more time to examine the drawing, or if we could leave. I mean, one hour staring at a drawing is quite enough isn’t it? What do you think of it? Did you know it had this size? Have you ever seen it? This sketch made by Cassandra is the only reasonably certain portrait from Austen’s life. Even so, Jane’s relatives were not entirely convinced by it: ‘there is a look which I recognise as hers’, her niece wrote, ‘though the general resemblance is not strong, yet as it represents a pleasing countenance it is so far a truth.’ It is, however, the basis for a late nineteenth-century engraving, commissioned by Austen’s nephew that will feature on ten pound bank notes. Did you know about that? The bank notes will be printed next year 🙂 To find out more about it, click here. If you ever go to London, you have to see the portrait, and then stop at the museum’s souvenir shop. It has so many goodies 🙂 I couldn’t resist buying some of them. The thrilling part in all of this for me is that this was just the beginning of exploring the world through my eyes as a Janeite. Yes, I’ve traveled to many places before and yes, I’ve seen amazing wonders, but to now reflect upon them as an ardent JAFF lover is to reflect on my travels in a whole new way. Did Jane ever imagine her writing would inspire people to go through such great measures to meet one another? Could she have known how her own ideas would cross not only borders, but hearts and minds in such memorable ways? From here, I hope to get a chance to talk to you about my trip to Bath in 2014, my visit to Chawton in 2015, the weird London stops I made in 2012, and even the unplanned Austen places I found along the way in the USA or even France. Even more, I’m so excited planning in my head the adventures I may take down the road. Perhaps Lyme Park will be next on my list, that would be a true dream come true, wouldn’t it? I will always see Lyme Park as Pemberley and cannot even imagine what it would feel like to be in such a place. I’ve heard before that, “All roads lead to Austen,” and this has never felt more true for me as it does at this point in my own life. I’m just more than grateful to share this road with so many other adventurous Janeites! What a lovely trip! I’m green with envy having never been across the pond! I shall have to live vicariously. This is a great feature you’ve started here. I’m new to your blog and enjoying it very much. Rita,I’m so delighted that you had such a fantastic time with Joana,Elizabeth and the rest of the ladies you met,on that special day. I can just imagine the non stop chatter concerning all things Austen! The fact that Joana and Elizabeth signed your books most have just been the icing on the cake!!! It must be really amazing to actually meet people that you have befriended on the intetnet, whose work you have rad and admired! To sit with them and have a chat over a cuppa,something so ordinary but now with added significance,because of the special guests st the table!! Don’t you just love Hyde Park,the gardens,Italian fountain,the river….? Must confess that I haven’t seen this portrait of Jane and I didn’t realise it was so small. Your husband must be a very tolerant man…..yes,we’d understand spending an hour gazing at Jane’s portrait,if would be a natural thing to do,but your hubby!!! He must have been bored to tears!! Have you visited Winchester Cathedral,where Jans is buried?? It’s s very special place and the town is very pretty. Looking forward to reading more of your Austen exploits,in the future! What a terrific post! Your travels and your pictures are delightful. 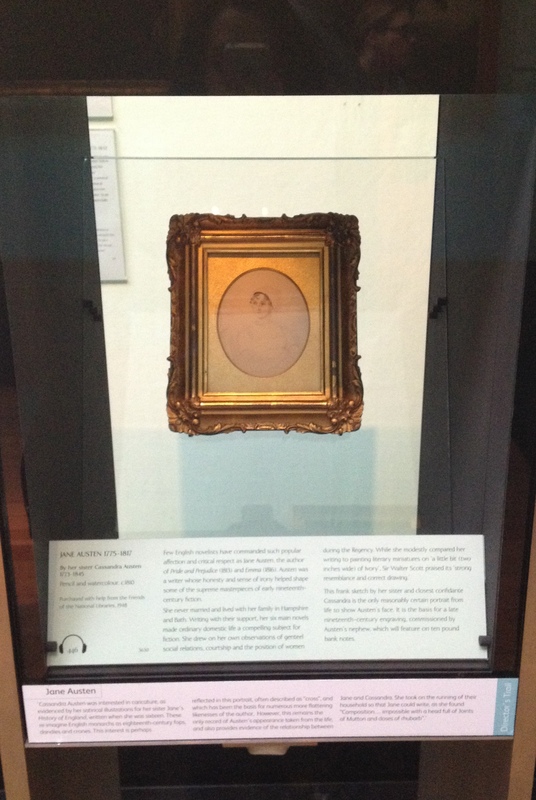 I have to say that I had no idea that portrait of Jane is so small since it’s so big in our own hearts and minds. Thanks for sharing your thoughts and insights. I hope you get to Lyme Park soon, but the bigger part of me hopes you get to NYC sooner so you can meet someone who’s dying to meet you… ??? Neat that you got your books signed and how generous of them to do so. I saw your earlier picture of the portrait and still marvel over the size of the sketch. That’s cute about your husband being so patient. I’d probably be just as bad and also fill a bag at the souvenir shop, too. Thanks for sharing about your experience and look forward to more of your Roads to Austen posts. 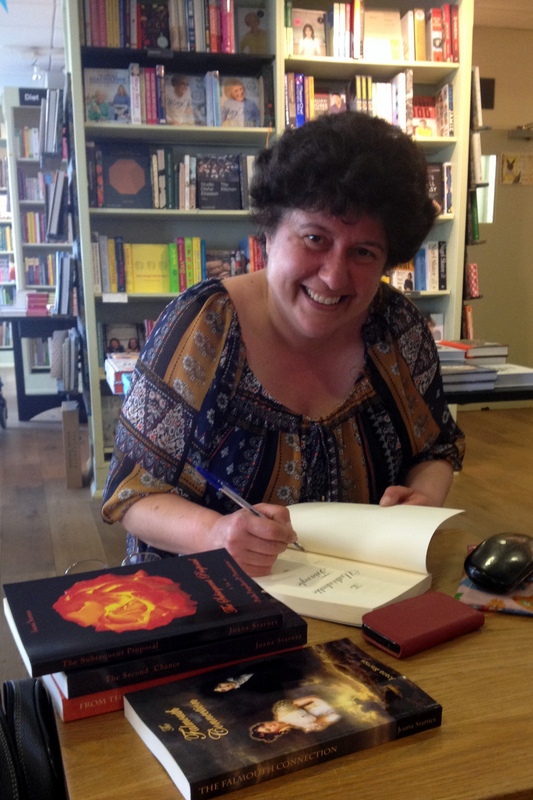 Delightful post on your trip to London and to sit and chat with such fabulous authors is amazing! I would love to visit the National Portrait Gallery not only to see all the amazing portraits but to see Cassandra’s ‘Jane’…maybe one day! I would have to agree that Lyme Park is ‘Pemberley’ in my mind as well. Look forward to your future ‘travel posts’! What a fantastic trip! Thanks for sharing. Looking forward to hearing more about your Austen-related travels. Your wonderful post brought back such happy memories! Two absolutely wonderful days 🙂 It’s exactly as you say, even though we hadn’t met face to face before the Kensington brunch, it felt like we’ve known each other for ages and that we were closer than real-life friends and neighbours we see every day. To me, this is the very best part about JAFF, the way it brings kindred spirits together. Jane Austen might have been incredulous and slightly amused at the amazing following she has 200 years on (bonnets, balls, the paraphernalia) but I think she’d be very touched and happy to see how she brings people together. It was such a joy meeting you face to face, and to me the icing on the cake was how we talked-talked-talked and we could still have talked for hours if we didn’t happen to remember we both have long-suffering other halves to go back to. Bless them, they’re so incredibly tolerant and patient!! I’m especially impressed with Rui waiting for an hour or so while you absorbed the magic of the sketch. It was a huge gallery of portraits, hopefully he found exciting things to look at in the meantime. I must admit I didn’t stay glued to Jane when I visited, there were so many familiar faces all around, all the glittery crowd of Regency salons, but I did come back to her time after time, since it was because of her that I became fascinated with all the others and the period they lived in. See you next time in Lisbon maybe? There is nothing like than visiting a place as a timid tourist, and then being taken in by hosts who turn out to be kindred spirit friends. Thank you for sharing your lovely, smiling day with us. I look forward to other articles in this series. It was so fun meeting you! I’m glad it worked out for everyone to get together. What a great morning! I just wish I had more time in London. I’ve learned my lesson that no matter long I spend there, I always feel like I’m leaving too soon. No I just need to visit Portugal. 😉 If you come to the States again, give me a shout and we’ll have brunch 2.0. What a fun feature! I can’t wait to read the next one! Great post, Rita! I’ve had the same experience meeting online JA fans in real life – it’s like you’ve known them for years 🙂 I guess, in a way, you have. Beautifully descriptive tale of your travels, Rita! Those are some lovely photos of you with everyone! Look forward to reading the next!